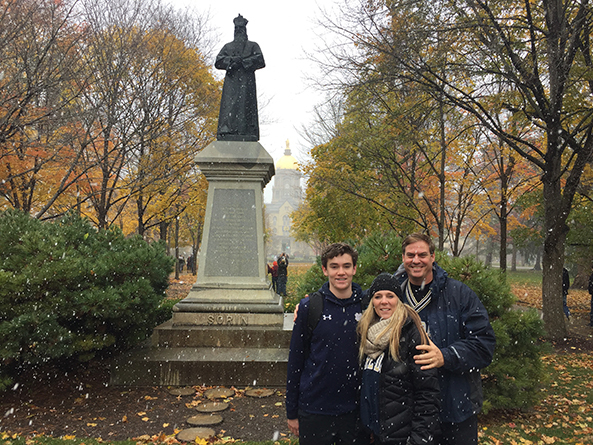 Above: Sen. Mike McDonnell, his wife Amy and their son Ryan attend a football game at the University of Notre Dame. Mike McDonnell was born and raised in Legislative District 5 in South Omaha. The home he shares with wife Amy and son Ryan is just four blocks from the house his parents built in 1957. “I’m like a pheasant. I’ve never moved more than two square miles from home,” he laughed. His parents were pillars of their neighborhood and community, helping to build the St. Thomas More Catholic Church and elementary school. Raising eight children in a working-class neighborhood was not necessarily glamourous, he said, but it did instill a robust work ethic in the McDonnell children. “It was not a neighborhood where we had everything we wanted, but we had everything we ever needed,” he said. Following his graduation from the University of Nebraska at Omaha, McDonnell followed his father’s footsteps, joining the Omaha Fire Department in 1989. Despite appearances, he jokes, McDonnell is not the reason his father retired the next year, following 40 years of service. He spent nearly 25 years as a firefighter, six of those years as fire chief. Representing his fellow firefighters for 10 years as union president taught him invaluable negotiation skills. Serving in the Unicameral is not so different from fire service, he said. Sure, there are metaphorical fires to put out, but McDonnell says the similarities do not stop there. You will not be successful without hard work and a willingness to cooperate with people of all ages and backgrounds, he said. He understands that a divisive political climate can make it difficult for elected officials to earn the trust of their constituents, but that has not deterred him from jumping in head first. McDonnell serves on the Legislature’s Appropriations Committee, a group of nine senators currently tasked with resolving a $1 billion budget shortfall. McDonnell understands that change does not happen overnight. He said it will take considerable compromise, making progress in small increments on the key issues facing Nebraska. At the end of the day, however, it is about the simple things, he said. When he considers what his legislative legacy might be, McDonnell thinks of his son. He knows he has 300 legislative days in his first term to do as much as he can to leave the state a better place.